My life is stressful. Most stay at home moms like myself have a lot on their plates. We worry about our kids, the home, our husbands and meeting the needs of others. Some stay at home moms even have to take care of their aging parents as well as their small children. No wonder so many of us suffer from stress and anxiety. According to the National Foundation for Brain Research, about 50 million U.S. adults suffer from anxiety disorders. Many of them also are diagnosed with clinical depression. The National Institutes of Mental Health states that during any six-month period, nine million Americans suffer from a depressive illness, costing the nation over $30 billion per year. More and more doctors are prescribing Prozac to treat depression and anxiety disorders. The pharmaceutical industry brings in $2 billion in revenue from this drug alone. Some patients are taking other prescription anti-depressants along with Prozac. Herbs and natural remedies have been around for years and many of them are known to help with anxiety and depression. Recently, I had the opportunity to try the 1Hour Break a new all natural sedative spray for anxiety and stress. 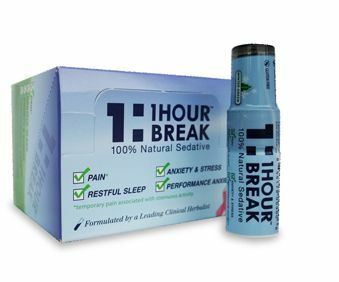 1Hour Break is made from Kava, Passion Flower, St. John’s Wort and Lobelia. This sedative is all natural and non-addictive. According to a study conducted in 1990, 38 patients who were suffering from anxiety compared the effects of kavain, a main compound in kava, and oxazepam, a benzodiazepane marketed under the trade name Serax, over a four-week period. Both kava and Serax reduced the anxiety equally but the patients taking kava did not experience the side effects (drowsiness, dizziness, headaches, and vertigo) of the other drug. When my two-year old scattered all of his toys around the living room and playroom I almost lost it. But instead of having a typical anxiety attack I sprayed the 1Hour Break under my tongue six times. After relaxing for a half an hour and not thinking about the mess, I was able to calmly help my son pick up his toys. 1Hour Break is soothing, works quickly and does not have any side effects. Healthy Moms Magazine readers can get a free sample of 1Hour Break by simply liking them on Facebook. Please visit: facebook.com/1HourBreakUSA for details. You can purchase 1Hour Break on Amazon.com. Healthy Moms Magazine readers can also enter for a chance to win a case of 1Hour Break which is four (4) display boxes, 12 units per box, 48 units total, valued at $180. All you need to do in order to enter is like 1Hour Break on Facebook, follow 1Hour Break on Twitter and leave us a comment at the end of this post. This contest ended on Tuesday February 7, 2012 at 8 am PST and is open to US residents only. I just stumbled upon this article and I suffer from terrible social anxiety. Being a mother of 2 and dealing with unemployment it is hard to go out for daily errands without some type of help. I am prescribed Xanax two times a day to help with my everyday activities but I hate the drowsiness, side effects, and the drugged up feeling. Now that I know an all natural alternative exists at this affordable price I am totally sold. I have been suffering like this since my first born in 1995. I just purchased a case from Amazon and liked their fan page. I am patiently waiting for my free sample to arrive – THANKS!. Do you know when and where this will be sold ? My support groups would love this stuff! Wendy, leave us your e mail address in another comment so you can enter in the giveaway. So far you can only purchase this on Amazon.com. I'm following 1 hr Break on Facebook and Twitter! Can't wait to try the sample. Thanks for the heads up! I love kava! I liked 1Hour Break on Facebook, now follow 1Hour Break on Twitter. Following on fb and twitter (@brightbirdsoap). Can't wait to try it and hope it really works! I like 1HourBreak on Facebook and follow them on Twitter. I like 1 Hr Break on Facebook and follow them on Twitter (@babybraddy). Follow you on Twitter (@babybraddy). Stumbled contest as z853www (Christy Ann). Like Healthy Moms on Facebook. Digg this post as Christy Ann. Joined BlogFrog Community as Christy Ann. Subscribed to Healthy Living Newsletter. Subscribed to The Healthy Moms Magazine. I like 1Hour Break on Facebook and I follow 1Hour Break on Twitter. I like 1 Hour Break on FB as Holly Storm-Burge & I follow on Twitter as @HollyStormEtsy. Thanks! I like 1Hour Break on Facebook. I now follow 1Hour Break on Twitter. I tweeted this contest on Twitter. Liked 1 hour break on Facebook and following 1 hour break on twitter. Like The Healthy Moms Magazine on Facebook. I follow @cltalbert on twitter! I like Healthy Moms on FB!